One of the most anticipated and exciting additions to Destiny 2 with the introduction of “Season of the Drifter” are the new weapons. Developers have raised audience’s interest in the game by adding gorgeous looking guns with stunning looks and lethal damage. Developers have added three new weapons in the game. This guide will only tell you about how to get the Oxygen SR3 scout rifle. If you cannot find Weak Synthesizer in the game, checkout our guide on How to Acquire Weak Synthesizer in Destiny 2. Moving on to the matter at hand, Season of the Drifter grants you 3 Pinnacle weapons. Each of them can be earned by playing a fairly long quest which will require quite a lot of your time. So, if you want to unlock these weapons, we suggest you buckle up. Remember, if the journey is long, the reward is more handsome. Same is the case with these weapons. Once, you get your hands on any one of these, you’ll feel that all the effort you put in was totally worth it. To acquire Oxygen SR3, the main quest that you’ll need to complete is “Redeployment” quest. During this quest, you’ll also be required to complete the strike Triumph, The Best Offense. Now to start the quest, head to Zavala who will be in the Tower as always. Interestingly most of the important quest starts by talking to Zavala in Season of the Drifter. Anyway, talk to him and he will grant you the Redeployment quest. Select the quest to start your mission. These tasks are fairly easy for most of Destiny 2 veterans. They may require some time, but in the end, you play the game because you enjoy it. So, spending time won’t be a problem right! Completing these three tasks will reward you with The Best Offense Triumph. 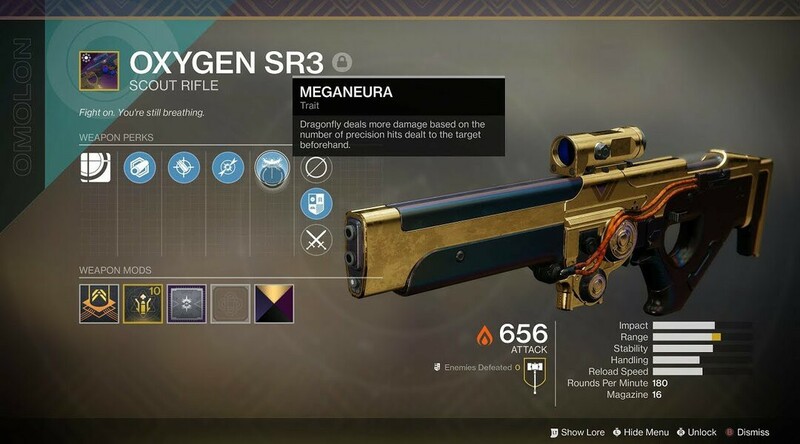 Give it to Zavala and in exchange he will grant you the Oxygen SR3. If you find any difficulty in completing these tasks, feel free to ask us in the comments section below.